After an eternity of staying away, Nintendo has finally given in to the lure of mobile. The games giant partnered up with fellow Japanese outfit DeNA, a billion-dollar company that made its name with phone gaming, in a surprise alliance announced today that will see the duo develop mobile apps. But don’t expect a sea change from Nintendo; mobile is an expansion of its existing reach and not a wide-ranging pivot away from games consoles. In a hastily announced press conference in Tokyo today, which was also streamed on YouTube, Nintendo President Satoru Iwata stressed on a number of occasions that the company will maintain a core focus on its dedicated video games business, despite finally this move to mobile. To make that clear, he pointed to the “unprecedented” success of Nintendo 3DS titles last year — five of which sold a record two million copies over a six month period — and disclosed that the company is working on a new console dubbed ‘NX’. In essence, Iwata believes the mobile apps (it isn’t clear whether they will be Nintendo or DeNA branded; though you’d expect the former given its global reach) can act as a sales funnel for a “more premium” experience on Nintendo’s standalone games consoles, such as Wii U and portable 3DS. That’s perhaps not the approach that many expected, but it is in keeping with Nintendo’s belief that console gamers are a loyal and dedicated bunch, even if they own a smartphone — as almost all of them doubtless do today. “Nintendo will continue to focus on dedicated games as a core business, [though] many may misunderstand [this partnership with DeNA] and think this announcement is because we are pessimistic of the video games industry,” Iwata said of the move to mobile. But, will the new generation of gamers really transition over to buying Nintendo’s hardware and dedicated titles based on mobile games, particularly with the sexier Xbox One and PlayStation 4 consoles — and their suite of mainstream games — in the market? That’s not clear at this point, but the Nintendo chief was very adamant that mobile is another platform for the company. Nothing more, nothing less. 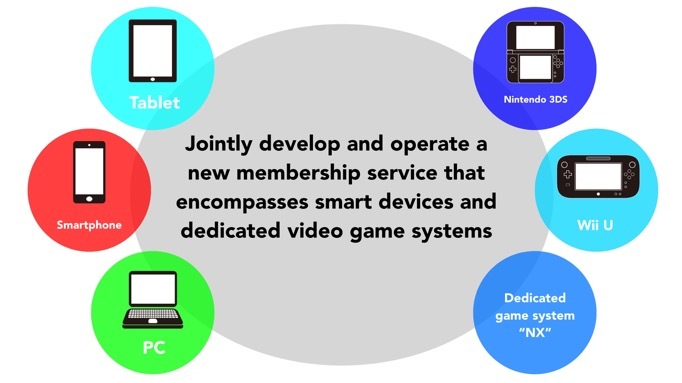 Indeed, the second part of the partnership is the construction of a service that will let users play games across a range of different platforms, including PC, mobile and Nintendo’s own hardware. So, by definition, mobile (tablets and smartphones) is a merely an extension of reach, rather than a more dramatic pivot to where the bigger audience numbers are. “We’re challenging ourselves to redefine what Nintendo platform means,” Iwata added. The press conference lasted over 90 minutes, but neither Iwata nor DeNA CEO Isao Moriyasu provided many nuggets of information that games enthusiasts worldwide are lusting for in the wake of this surprise news. Both explained that games will not simply be ported from Nintendo devices to mobile. Rather, they will be built from the ground up using Nintendo IP in a way that “ensures the quality of game experience.” But, at this point it isn’t clear which of Mario, Link and Nintendo’s other cult characters will make the leap to a small screen near you. Nor, indeed, when they might do that. The duo have pledged to focus on quality rather than quantity, rather than a mass unleashing of the Nintendo stable. But there are high targets. With Nintendo’s IP — which Moriyasu described as “the most beloved” of any games company worldwide — powering its titles, there’s an expectation that this partnership will hit the ground running with a series of hits. Interestingly, the alliance included mutual investments in each company, but Iwata said the future of the partnership — while exclusive — would come down to results. Also elusive — and important — at this point is how the games themselves will be priced. Comments from Iwata about the way some developers use in-app purchases, particularly targeted at young users who perhaps don’t know better, appeared to distance Nintendo and DeNA from a reliance on the freemium mode that turned the likes of King.com and Supercell into billion dollar entities. Based on that, it seems unlikely that Nintendo will go for the GACHA mechanism which DeNA has been a famous proponent of in the past. Plenty of people I know would be willing it pay relatively high prices for an authentic Nintendo experience on mobile, particularly if unspoiled by in-app purchase dynamics, but it remains to be seen how such an approach would resonate with the global gaming market — many of whom may not be as intimately familiar with Nintendo and its legacy as those born before 1990. But monetization is an important part of the equation here, on mobile it defines a game and the experience for gamers. It needs to be just right. 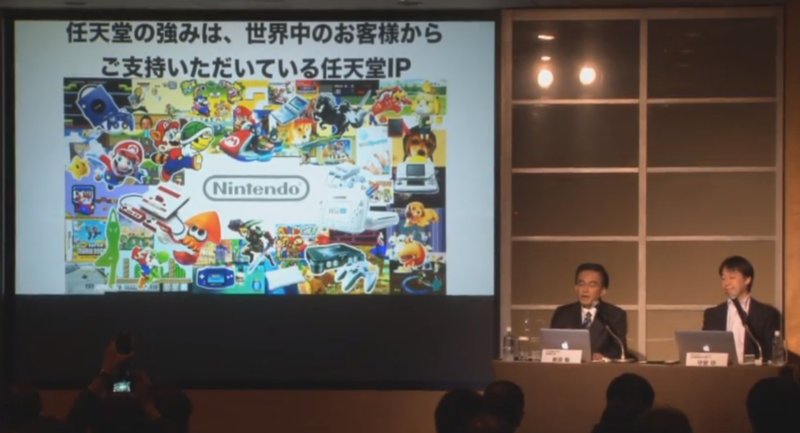 Moriyasu cautioned that current business models are subject to disruption and change often: ‘what’s hot now may not work tomorrow.’ Nintendo’s Iwata added further intrigue with a bold statement that the companies will invent a “new” business model for the genre. Zero hints were given today, but Nintendo might consider adding a subscription-based pricing system — which could tie into the multi-device platform — to the mix. Perhaps certain parts of a game are unlocked unless you pay a Netflix-style monthly fee to access it, and other VIP sections of other Nintendo-DNA titles? Perhaps the price is tied into ownership of Nintendo hardware? There’s plenty of food for speculation here until the two companies provide further details, that’s slated to happen sometime before the end of the year. What is more certain from today, however, is that Nintendo and DNA won’t go down the route of stuffing the titles with in-app purchases via the freemium monetization method. That is reassuring for Nintendo lovers at this point. Further, Iwata is cognizant of the fad-based nature of mobile games. It seems the intention is to build meaningful titles that bring the feeling of Nintendo gaming experience to mobile without milking users for money as social games makers have become notorious for. I really had to thoroughly consider how we would be able to grow the business by maintaining and nurturing the value of Nintendo IP and what conditions would make that happen, because the value of content can easily be deflated in the digital world and, especially on smart devices, it is not easy to maintain content value since the lifespan tends to be very short as much content is released and then replaced so quickly. We are making these announcements today because we now have Nintendo’s answer to these questions. Though it isn’t sharing all the details right now, I like the cut of Nintendo’s jib.